The First Annual Charles Dickens Christmas Dinner featuring Shanti Shanti was a great success. 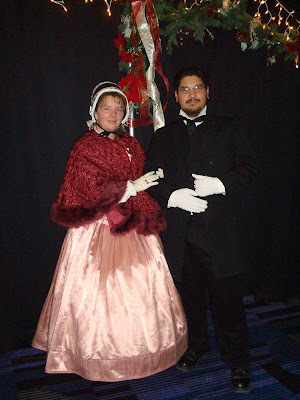 Joe and I went dressed in our Victorian finery and provided a bit of “color” for the party quests. The food was good, and the entertainment was superb, despite the technical difficulties. And, surprisingly, the venue was cozy and intimate considering it was in a large hall at the Bowling Stadium. The above picture is the only one we got at the event since I almost forgot that I even took my camera.